Are your kids back at school yet? Many of the schools around me start this week or next. Hazel goes back next Wednesday. Our summer is coming to an end and it feels like it just began. Such is the way of life. Today I am going to share three books for kids starting school or about school (and its lessons). 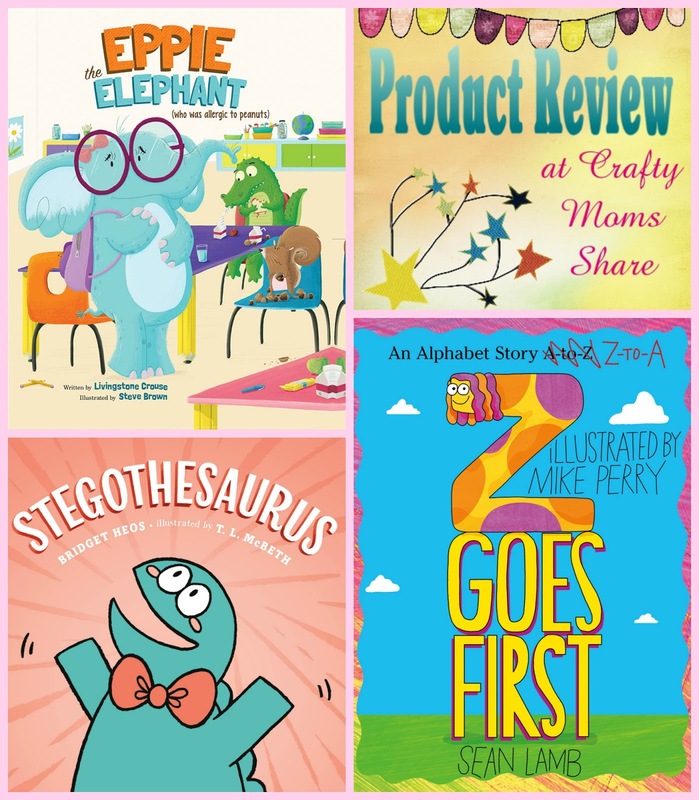 Each child has his or her own difficulties and anxieties about school and these books seem to help kids with different ones. The first is for kids with allergies or who will be in a class/school with kids with allergies. 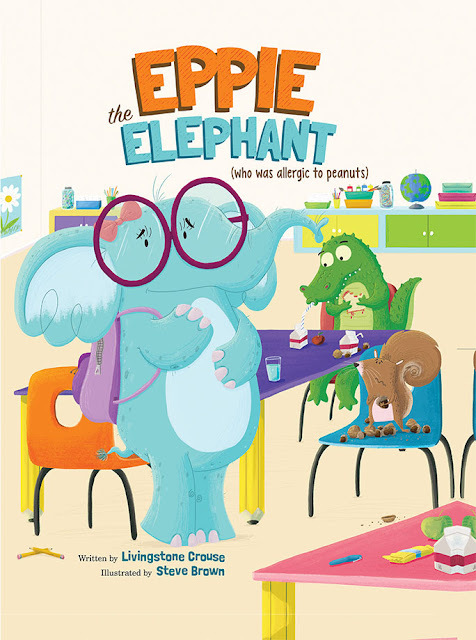 It is Eppie the Elephant (Who Was Allergic to Peanuts) by Livingstone Crouse and illustrated by Steve Brown. Now I don't know about you, but I know lots of kids with allergies and it is a huge deal for their families. I have a very close friend and both of her kids have nut allergies and the youngest is also allergic to seeds and other foods. They happened to move to the other side of town before the youngest started school and the elementary school on that side was not as allergy friendly. It has been a hard adjustment for the mom. Well this book is about an elephant who is allergic to peanuts. It is her first day of school and she is very nervous. She is afraid the other kids will find out about her allergy and think she is strange and not like her. Well Eppie is brave and gets into the school and meets Allie the alligator right away. 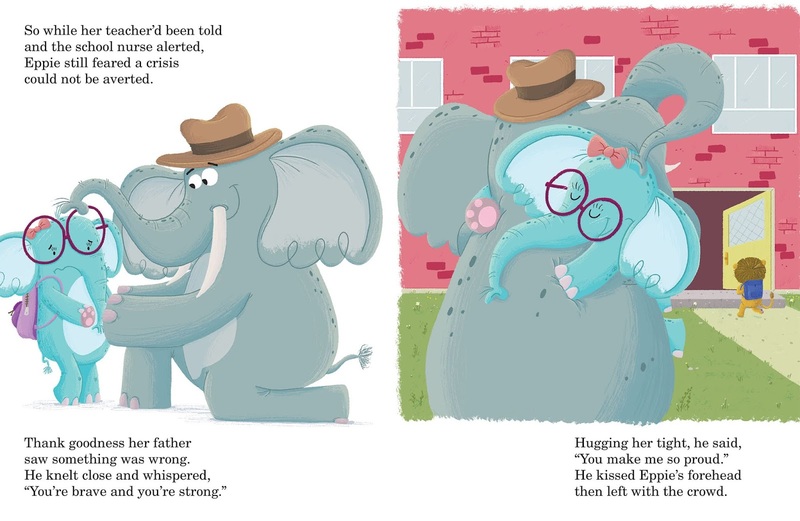 Eppie and Allie quickly become friends and then Pearl the squirrel joins them and the three are inseparable. That is until lunchtime when their teacher tells Eppie she has to sit at the table far away marked with a "No Nuts" sign. He informs her friends they cannot sit with her since they both have peanuts in their lunches. Eppie is heartbroken. She struggles through the day trying to avoid her friends and the next morning does the same thing. But then at lunch her two friends are sitting at the nut free table. They tell her they had their moms make them tuna sandwiches so they could sit with her. What I love about this book is how it shows someone facing her fears and how she is feeling about the comments and looks she gets. It shows the real emotions many kids with allergies have with the new school rules to deal with them. I also love that her friends come around to understand that they have to change their lunches to eat with their friend and don't want her to be isolated from them. It shares so many of the things I hear from my friends whose kids deal with allergies every day. I think this is a book that everyone should read. The story itself is cute and entertaining. It is written in rhyme so it is fun to read and listen to and the pictures are cute. The book is recommended for ages 6 and up, but I think it should be read for kindergarten and even pre-kindergarten since they will learn about allergies if someone in the class has them. 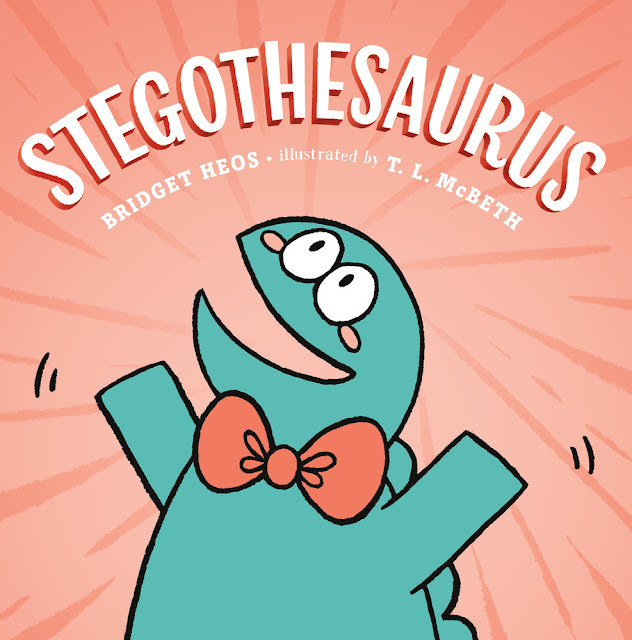 Our next book is Stegothesaurus by Bridget Heos and illustrated by T.L. McBeth. This book is not really about going back to school, but helps teach about synonyms and a thesaurus. In a family there were two stegosaurus brothers and a stegothesaurus. The stegothesaurus likes to use many words --often long words to describe everything. He doesn't understand why his brothers always just use simple words. One day they run into an allosaurus (who eats stegosaurus) and the brothers ran after they simply yelled "Scary!" 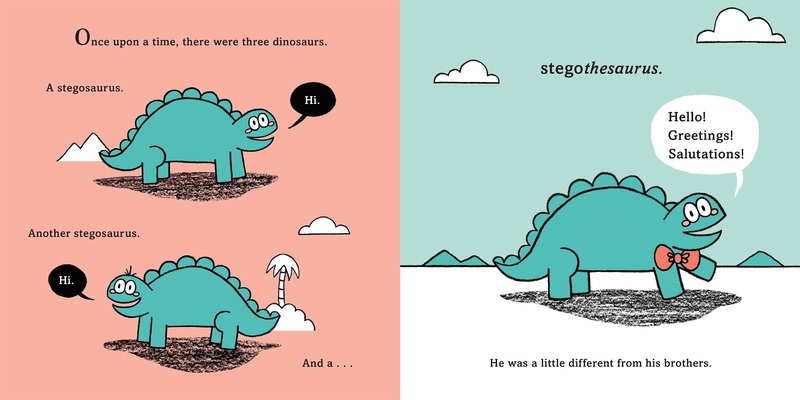 The stegothesaurus however was still thinking of good words to describe the situation. The allosaurus gave him more big words to describe her and told him she was a allothesaurus. They had a wonderful time sharing different ways of describing things they saw with each other all day until it came time for dinner. Then the stegothesaurus thought run and ran to his brothers. Things I love about this book are that it teaches synonyms and some great vocabulary words. The pictures are rather simple, but they fit the story and make it so the dinosaurs are not very scary. The book is recommended for ages 4 to 8. 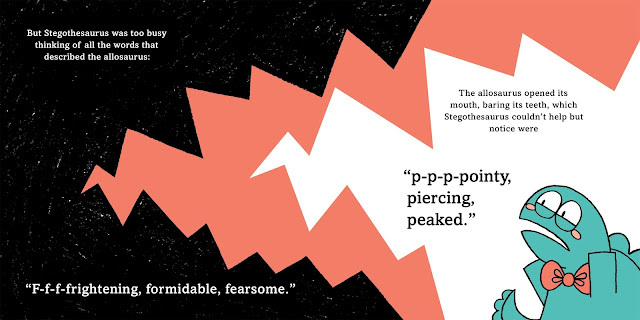 This book would pair with introducing students to a thesaurus. Our next book is an alphabet book with a twist. 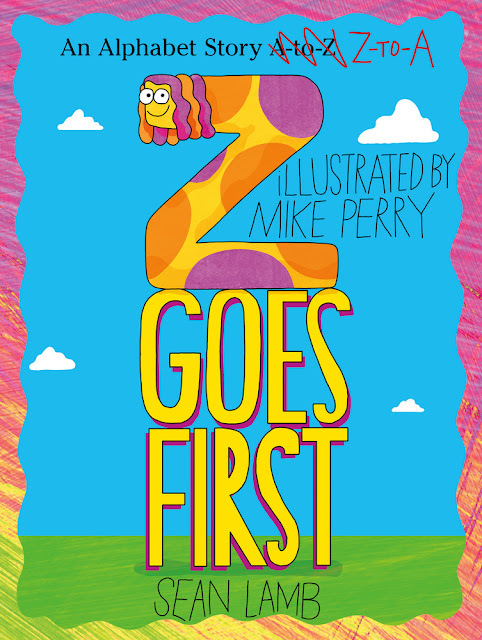 It is Z Goes First by Sean Lamb and illustrated by Mike Perry. 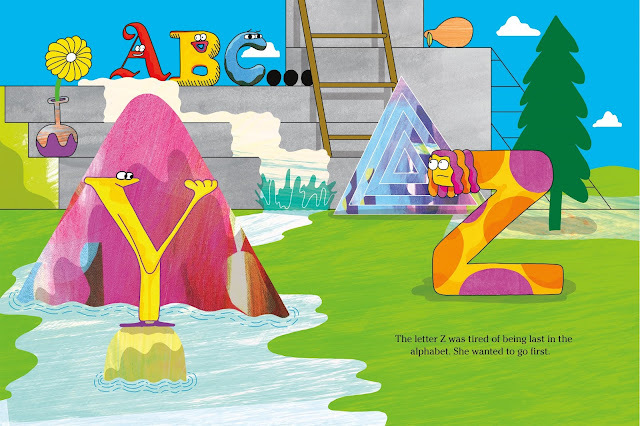 In this fun book Z and Y decide they want to go first and don't understand why A and B always get to be first. They go up to A, B, and C and tell them they want to go first. A lets them and A, B, and C sing the alphabet for them as they walk through the line. They bump into some letters who don't want them to go through, but they work their way through the line back to the end of it. Things I love about this book are the little jokes and plays on letters throughout it. Things like J and K tell Y and Z a "joke" and then when Y and Z are shocked J and K yell out "Just Kidding!" There are little things like that throughout the book that are fun to pick up on. I also love the idea of a letter besides A going first. However it is not what I expected. I am not sure what I did expect, but it was not them walking through the line from the front. 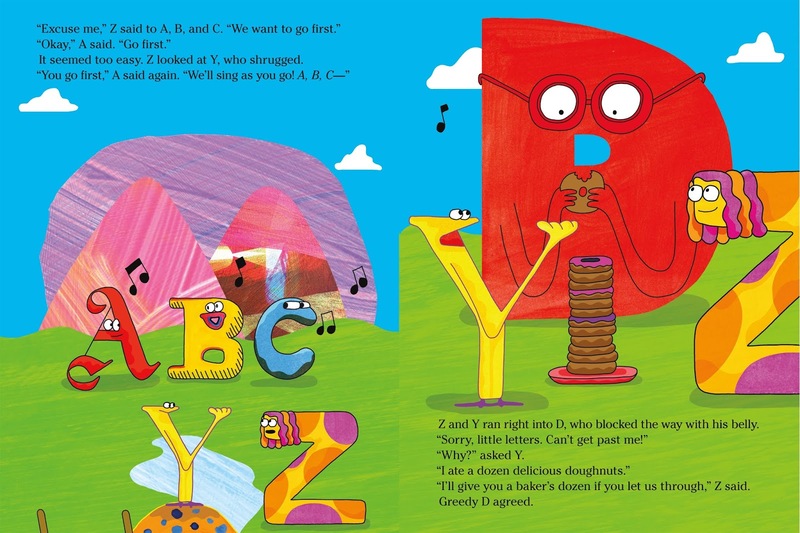 This book is recommended for ages 3 to 6 which is a prefect recommendation since it is about the alphabet. 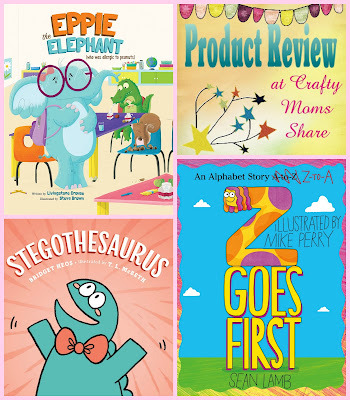 I hope you will check out these fun books that bring kids back to school in a fun way.